If you follow me on Twitter you might have seen my tweet about doing a photo shoot in the rain... yeah this is that shoot. Thank goodness for the hat, at least that kept my face semi-dry! Not only was it raining but it was also lightning and thundering like crazy! Looking through the pictures actually made me laugh because there were a few where my eyes were huge and I was ducking for cover. << Good times. I actually wore this outfit out for a Sunday Funday doing some day-drinking (that's my new word, be prepared to see it more) at a local Belgian beer bar and then out to dinner for a friend's birthday. It's such a comfy outfit, it's almost like wearing pajamas out! The skirt is a super soft cotton material that has a bit of stretch to it and the top is super flowy and comfy. I love the pattern and colors in the skirt and how well it pairs with so many different things. I was originally going to wear a white t-shirt tied to the side with it but I'm really glad I didn't now however that will definitely be an outfit for the future. I am obsessed with that skirt!! I love the tribal print it has going on and that fedora - lets just say I've had a really hard time finding one I love as much as I love yours! that's the one bad thing about being a style blogger--the weather! 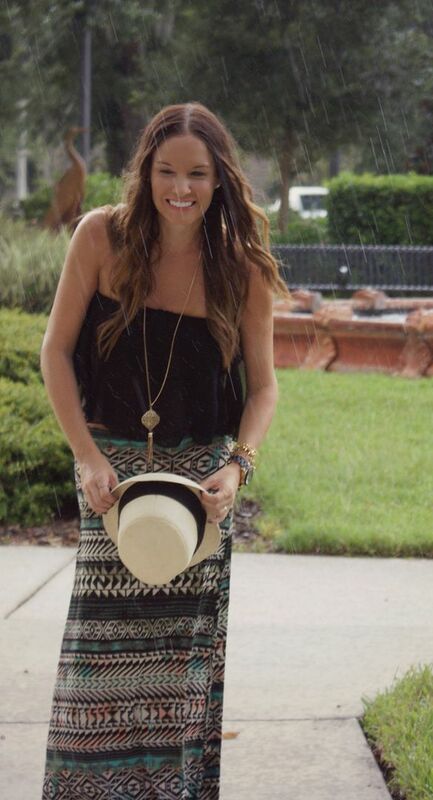 oh that skirt is perfect, and i love the hat!! this whole outfit is fabulous and girl you are dedicated doing photo shoots in the rain! Love love that crop top! Gorgeous as always! Girl you can rock a crop top! Wish I had your abs! What a fabulous outfit, you own that crop top lady! Still looking fabulous in the rain! Another example of panama hats saving the day! Awww, these photos are so fun! And love your crop top! These pictures ended up so cute!! And I love this outfit! Comfy AND cute is a major win! Love the top and skirt paired together- this is perfect for summer! Almost bought those sandals from Target the other day...Love the SD bracelet too. cute skirt! i love the print. also, day drinking on sunday funday is THE best. theeeeeee best. Love the flowy crop top! And I'm impressed your hair is still so freaking pretty even with it raining! I love that skirt! So pretty! P.S. If I tried to shoot anything in the rain my hair would grow into a giant Lion's mane! You are lucky - your hair looks gorgeous! I absolutely love this outfit!!!!! That top is to die for! Adding it to my want list! Love how you still did the shoot in the rain! Perfection! This is perfect! You are speaking my language with that Sunday Funday speak! Loving everything! The skirt is fabulous! such a cute look! and dancing in the rain definitely had to make for an interesting shoot! I spy a flutter bandeau! Love it! I love this maxi skirt and ruffle shirt combo! The rain also ruined my photo shoot plans this past weekend and I wasn't brave enough to step out and give a try like you did! You wore a crop shirt for day drinking.....which I'm sure involved some day eating......ummmmm of course you did and looked amazing every step of the way. Love that first picture of you. Like love love love it! What a great photo op! :) I love the loose fit of this crop top with the tighter maxi :) You look very pretty hun! Looks like you made the best of a rainy day and looked great doing it!! That skirt is adorable! Oh gosh, check out that pouring rain!! You still look cute girl! !